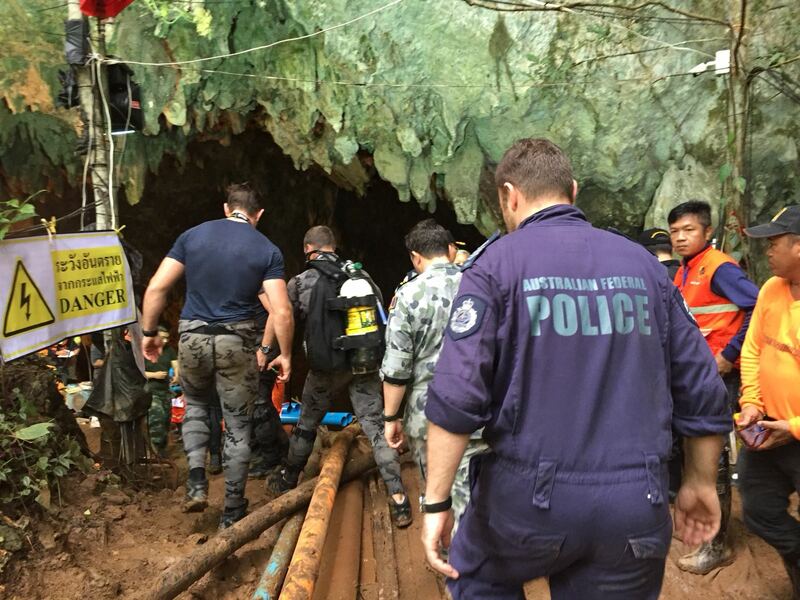 Australian Federal Police (AFP) Specialist Response Group (SRG) divers continue to assist the complex and ongoing cave rescue operation underway in Chiang Rai, Thailand. The rescue effort has reached a critical stage, with important decisions to be taken on when and how to evacuate the group given the challenges of sustaining them in their current location and the dangers in evacuating them through high water levels. Thai Navy divers have transported enough food and water to last two weeks to the group, plus space blankets, with support from our divers and other international teams. The AFP dive team and Australian support staff remain closely engaged in efforts to support and sustain the group, as well as in planning. This includes supporting the Royal Thai Navy to transport food, water and first aid supplies into the cave system through to the group. The team are also working with the Royal Thai Navy and international responders to put in place air tanks and diving equipment, which will be necessary to safely evacuate the group. This is being undertaken in challenging conditions and in tight areas that can be difficult to manoeuvre through. The AFP dive team are sequencing their diving operations with Thai and other international responders. The AFP dive team has specialist dive capabilities with experience conducting searches in zero visibility areas, land search and rescue, and diving in flooded caves. The team travelled from Canberra on Saturday 30 June. The AFP team were not diving at the time the group were located by two British civilian professional cave divers. The AFP team ceased diving operations at 5:00pm on 2 July and the group were located at approximately 10:00pm local time (1:00am AEST) on 2 July. The AFP team have been involved with moving food and water, first aid supplies and air tanks through the cave system in support of Thai-led rescue efforts. AFP National Media: (02) 6131 6333 Note for editors: An AFP media officer is on site at Chiang Rai to assist with media requests in country. Please contact the AFP Media Team in Canberra for details.